Cuban food has a flair that is composed of island flavors and Spanish influences and make some of the best BBQ food. A mixture of citrus, oil and our spicy dry rubs make a Cuban style marinade that compliment pork (and Chicken) no matter the preparation. 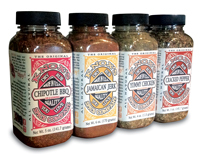 Mix ingredients in a bowl and use as a Cuban style marinade/baste for chicken or pork. Great for every cut from pork chops to tenderloin as well as roasted chicken to chicken fingers. Spicy and sweet that is sure to please no matter what you are marinating or basting.